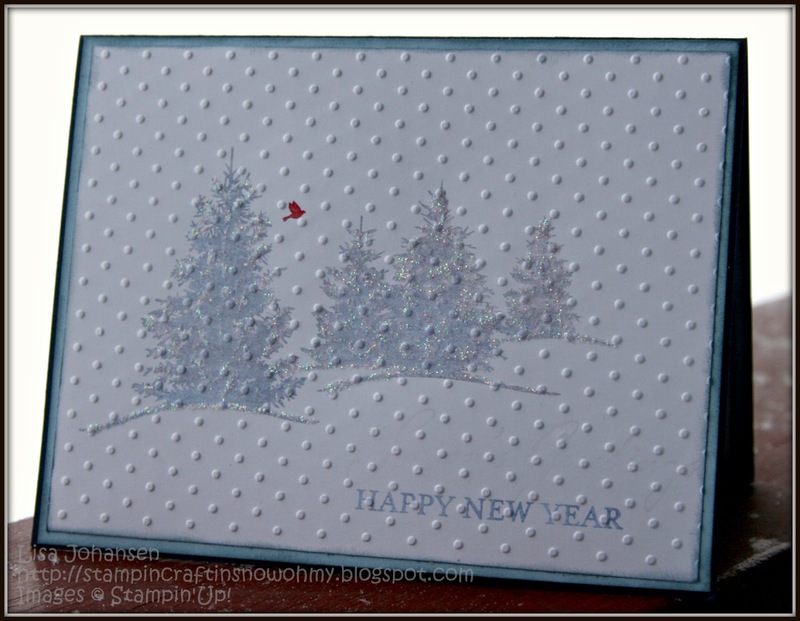 Snowy Moose Creations: Into the New Year with Friday Mashup! 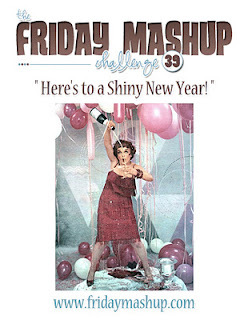 It's the last Friday Mashup challenge of 2011, where has the year gone? I hope you've enjoyed the challenges that The Friday Mashup has brought to you in 2011 and I hope you'll come back for more in 2012! Today's challenge comes to us from Kasey, and she wants us to create a project that sparkles, a project celebrating New Years or mash them up and do both! I mashed them up but not in a traditional sense. I chose to use the very serene scene from A Scenic Season, one I've used quite a bit these last few months. 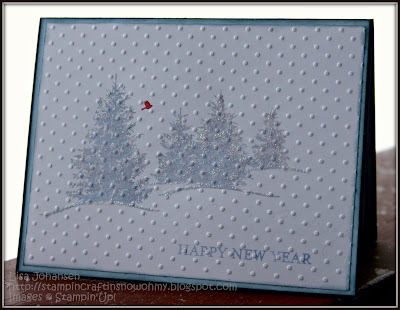 I just love this stamp and its a reflection of how my family and I will be ringing in the New Year.....at home, surrounded by trees and snow, our own winter wonderland. We'll reflect on the year that has gone by and wonder what we will encounter in 2012. The trees are covered in Dazzling Details, so in the light this card does sparkle and looks quite pretty! I also used this weeks color challenge over at Splitcoaststampers for my color scheme. -Make a project that "Sparkles". -Or Make a project "Celebrating the New Year". -Or "Mash it Up" and create a project "Celebrating the New Year that Sparkles" . Head over to the Friday Mashup challenge to see the rest of the inspiration from the design team and then play along with us! Also, don't forget that challenges 37 and 38 are open until Jan.4th. With the holidays we wanted to give everyone some more time to play along! Happy New Year Lisa. Your card looks like it's snowing with those dots! Love your sparkly trees. I think it would be amazing to ring in the new year in a winter wonderland. I'm sure I'll be grumbling about the fireworks as I try to go to bed early. LOL Love the serene feel of this one and that little red bird is just darling! This is so soft and serene.. I love how you see just a little Red Bird flying by amongst the white background. I love this image for a wintery January scene! so pretty and serene. Love the little red bird!